Gutters Need Cleaning? Roofing gutters should be cleared seasonally to avoid water build up and overflow – otherwise you risk costly damage to your roof, and property interiors. Damp, mould and even flood damage can result, not to mention damage to building foundations if water is not flowing correctly away from a dwelling. 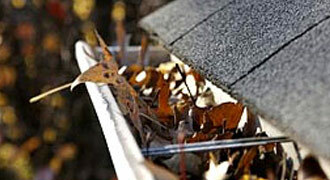 Falls from ladders cleaning gutters is one of the most common forms of injury and hospital admissions in Australia. We urge you not to risk it. Your local Jim’s team have all the correct equipment, training (and insurance) to professionally and quickly clean your gutters, leaving your property safe and damage free. Your local Jim can help clear and clean household roof gutters, as well as install a gutter guard to help prevent direct debris entry into the gutter channel. This will reduce maintenance time and costs going forward. For a Same Day gutter clean, call your local Jim’s today on 131 546 or Book a Quote Online now. Remember, all of our Jim’s are police checked, fully insured and trained. And our work comes with the famous Jim’s 100% Satisfaction Guarantee.